Thomas wakes up to find that he is in the centre of a mysterious maze. He doesn't know how he got there and he doesn't remember anything about his past - even his own name. Lots of boys have suffered a similar fate. Finding no way out of the maze, the boys have created a society within their limited environment - called The Glade. Each boy is assigned tasks to complete for the overall benefit of the group. The strongest, most athletic boys become maze runners. Their task is to map the maze and try to find a way out. The boys all desperately want answers as to why they have been abandoned. The maze mapping must be done before the maze closes at night and its walls shift. No one must be left in the maze overnight - to do so risks them being attacked and infected by the monsters that lurk within. Never Know What Film To Watch? Click Here And Let 500 Days Of Film Help! This film made it onto my 500 days of film list because of my son. He became addicted to the first Maze Runner book and was desperate to watch the film with me. Having heard snippets of the plot from him, I was intrigued. However, I was also a little wary as the film sounded similar in many ways to the The Hunger Games. I was right to feel this way - the influences of The Hunger Games are clear on this film. Sadly, despite an interesting premise, The Maze Runner never matches the tone, characterisation or tension of The Hunger Games. That is not to say that I didn't enjoy this film. It has a few thrilling set pieces and features a superb performance from Will Poulter. 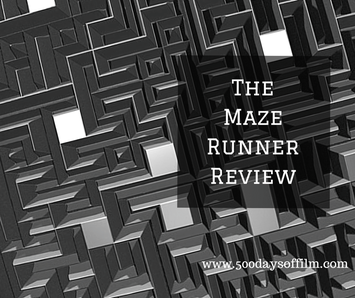 I just felt that the whole maze running section of the film was a little brief and wanted more inventive and scary scenes in there. Having loved the book, my son was a bit bemused by the film. He enjoyed it but felt sad that certain parts of the source material were left out or unexplained. It was great to have him on hand to give me a debrief after the film had ended! The end of The Maze Runner sets things up nicely for the sequel - The Scorch Trials - that will be released in September this year. Have you seen this film? What did you think? Hunger Games light? Or something worthier? Let me know in the comments section below!